This is a phrase every Nigerian is familiar with. Our mothers say it us, and we say it to others out of anger or spite. But is there an underlying truth there? Do some people have exceptionally bad breath? The answer is yes. Some people have REALLY stinky breath and the causes can easily be traced. In honour of World Oral Health Day, this article covers some of the major causes of bad breath among Nigerians with some tips on how to prevent it. What causes bad breath exactly? Every human condition under the sun, no matter how commonplace it seems, has a medical term. Bad breath (mouth odour) is not exempt from this. It is called halitosis. Listed below are some of the common causes of halitosis aka mouth odour in Nigeria. Food: This is the common cause of bad breath in Nigeria. Why? Because everybody eats. Not that the other lists in this article are not popular – it is just that most people have mouth odour due to their choice of diet. For example, foods like garlic, onions, coffee, and spicy foods can give your mouth temporary bad odour. That is why we always advise our patients to brush their teeth twice a day (morning and night), and use a mouthwash. Tobacco: Smoking has several negative side effects and we are strong advocates of living a smoke-free life. Smoking and tobacco use causes bad breath, oral cancer, stained teeth, and irritated gums. All these are the reasons why we advocate against smoking. Dental Issues: Mouth odour can also be caused by dental issues. Examples are cavities, gum diseases, and crowded teeth. If you are not sure if this applies to you, speak to a dentist as soon as possible. Bacteria: The average Nigerian does not brush regularly, let alone floss or visit the dentist. As a result, the chances are high that bacteria will build up in your mouth, thus leading to mouth odour. The only way to keep this foul-smelling sticky bacteria at bay is to brush regularly, floss, use mouthwash and get routine dental checkups. Dry Mouth: Have you ever gone for a long time without food and water and notice that even though you brush your teeth, your mouth still smells? That is because the lack of saliva creates dry mouth which in turn causes bad breath. Other causes of dry mouth include smoking, side effects of some drugs, or breathing through your mouth ( maybe as a result of a blocked nose). Another reason for dry mouth could be a symptom of an underlying health concern. If you are not sure, the best thing is to speak to a dentist. Disease: Finally, diseases can also cause mouth odour. Examples of these diseases include sinus infections, tonsillitis, respiratory issues and in some cases, even diabetes. To make matters worse, some medications used to treat these diseases can cause dry mouth – which makes the smelly mouth even worse. The solution? Speak to a doctor as soon as possible. Mouth odour can be very embarrassing. Nobody is immune to the stigma it causes, especially in a social setting. This is why it is important to prevent it. But before you can prevent it, you first need to understand the cause. The starting point is to examine your current lifestyle and make some changes. These could mean quitting smoking, adopting better oral health care routine such as brushing twice a day and using mouthwash and visiting a dentist for routine checkups. Would you like to speak to a doctor from the comfort of your home? 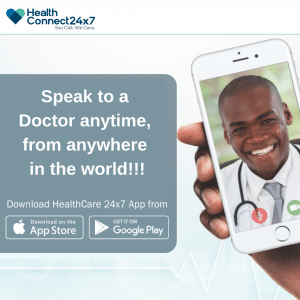 Download the HealthConnect 24×7 mobile application for FREE today. Fully registered and licensed member of the Medical and Dental Council of Nigeria (MDCN) with an interest in Dermatology and Aesthetic Medicine. We all experience an occasional itch every now and then. Some are more pleasant than others.